The archive in Leeds is full of treasures that can evoke memories and reminiscence. Relive the fashions of the past with our clothing collection, remember the tastes of the yesterday with our food packaging and see if you can spot something familiar amongst our homeware and toys. All groups will be offered free refreshments. Our building is fully wheelchair accessible and we have two blue badge spaces that can be used by groups visiting in minibuses. 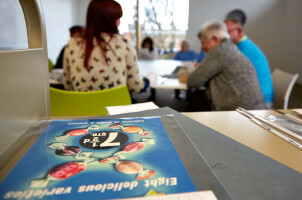 Join us at our free monthly Memory Cafe, held at the archive in Leeds. More details can be found here. If your group is unable to visit the archive our Outreach Officer can bring objects and run a reminiscence session with your community group or care home in the Leeds area. Reminiscence therapy can improve mood, wellbeing and some mental abilities such as memory. Our Memory Boxes contain original clothing and accessories that can be used as memory prompts and to stimulate conversation. The boxes can be borrowed free of charge for a maximum of two weeks, contact us on 0208 7182800 or email us at company.archive@marksandspencer.com for more information. This is a fabulous approach to people, carers and organisations supporting with Dementia. I work for Tunstall Healthcare another Yorkshire company who have been around for over 60 years providing pendant alarms and assistive technologies. We are a Dementia friendly organisation and I have Dementia Champions in my team. Apart from planning to visit your exhibition myself I will tell our customers about your Memory cafes. As an organisation Tunstall may also look to use your venue as a meeting place. Hi, I am interested in the Community group and reminiscence. We are a Care Home in Winchester and I think you have probably been here before. Is there anyone who could advise me? Kindest regards.